ResponseNow is committed to providing an outstanding service to all of its customers. Whether you have an In Home system or the mobile Belle pendant, our proven system makes getting help as easy as 1-2-3. To receive immediate emergency operator assistance, press the pendant of your medical alert system. For Belle users this is the button located in the middle of the device; for In The Home customers you can press either your traditional pendant, fall detection pendant, room and hallway button, or the large emergency button on the base station itself. The call is now being placed to our 24-hour monitoring center. Please standby to receive help. 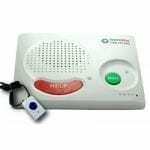 Generally, it takes approximately 30-60 seconds from the time you press your medical alert pendant before an operator will come over the two-way speaker. Call times on Belle can vary due to available cellular coverage. The operator will greet you by name and ask if you need help. You are encouraged to tell them exactly what you need, whether that’s just the assistance of a nearby family member or friend, or if it’s emergency services such as an ambulance, police or fire. If for some reason communication cannot be established over the ResponseNow device, operators will dial any home phone numbers we have listed for the account. Should no one answer, we will dispatch emergency services for a wellness check and begin calling your listed contacts. At this point, the operator will have assessed the situation and taken steps to dispatch the appropriate level of care needed. We can stay on the line until that help arrives or whenever you feel comfortable ending the call. Medical emergencies can be an unsettling experience but with a ResponseNow medical alert system, you can have peace of mind knowing your safety is in sure hands.